***This Course is not designed to take the place of the behind the wheel EVOC updates. The LEDS course is designed to work in conjunction with the EVOC update to strengthen decision making skills in a variety of emergency and non-emergency situations. 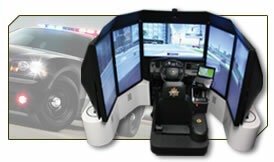 ENFORCEMENT DRIVING SIMULATOR (LEDS), DEFENSIVE DRIVING CONCEPTS, RECOGNIZING DANGEROUS DRIVING ATTITUDES, INTERSECTION ANALYSIS, COLLISION AVOIDANCE STRATEGIES, VEHICLE CONTROL TECHNIQUES, EMERGENCY VEHICLE OPERATIONS, PASSING, VEHICLE CODE PROVISIONS, VEHICLE PURSUITS, AND RELATED SAFE DRIVING AND VEHICLE DYNAMICS ISSUES. PROGRAM. BACKFILL APPROVED. TUITION FOR RESERVES PEACE OFFICERS IS $79.00 PER PERSON.